The New Generation Intel® Xeon® E5-2600 v4 Server and Storage solutions deliver up to 30% Increased Performance and 35% Improved Energy Efficiency with Strongest Support for NVMe in the Industry. 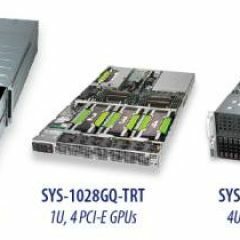 Supermicro new Intel® Xeon® processor E5-2600 v4 product family across SuperServer®, SuperBlade®, SuperStorage, SuperWorkstation and DP/UP motherboard product lines. Over 200+ Building Block Solutions® take maximum advantage of the increased compute performance offered by Intel’s new processor technologies. Solutions offering up to 44 cores and 3TB of 2400MHz DDR4 memory enable customers to design solutions that scale, accelerate and streamline data intensive, mission critical workloads and applications. New 2U TwinPro™ SuperServer® with 25G/100G SIOM option, 2U Simply Double with 48x 2.5” hot-swap NVMe/SAS3 drives and 4U 60x 3.5” hot-swap bay SuperStorage solutions are leading examples of Supermicro’s technology and architecture advantage. 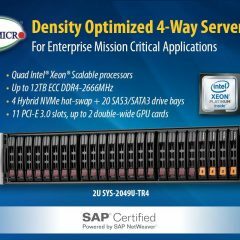 Combining the latest Intel® Xeon® processor E5-2600 v4 family with 6x performance NVMe storage technology and highest bandwidth networking options, Supermicro new generation server and storage solutions are the key to successful deployment of highly scalable, energy efficient, IaaS offerings. The new Intel Xeon Processor E5-2600 v4 product family will accelerate insight and deliver amazing end-user experiences as the foundation of advanced cloud solutions,” said Lisa Spelman, vice president of marketing, Intel Data Center Group. “Our ongoing collaboration with Supermicro is driving rapid innovation on Intel’s leading edge technologies and is helping to accelerate the next generation of cloud computing. 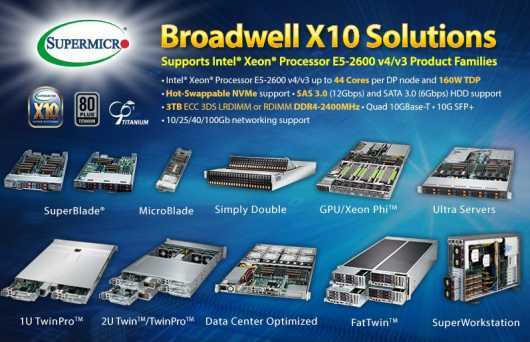 Supermicro Solutions supporting new Intel® Xeon® Processor E5-2600 v4 family are unrivaled in the Industry for the breadth and range of configurations available to design and deploy any scale computing, storage solution. Supermicro Green Computing solutions accelerate applications up to 30% and run demanding workloads with record breaking performance, Keep IT Green, and maximize energy savings with up to 35% system power efficiency increase. 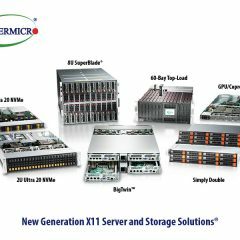 Supermicro introduces the IT industry’s broadest portfolio of new generation servers, demonstrating the highest performance, energy efficiency, and cost effectiveness. The performance and efficiency gains of three Supermicro SuperServer® systems were measured with the latest generation Intel® Xeon® E5-2650 v4 “Broadwell” CPUs versus previous generation E5-2650 v3 “Haswell” CPUs. The servers tested included representative 1U, 2U, and 4U systems. System performance was measured with the High Performance Linpack (HPL) benchmark and system Power Efficiency was measured using power meter wattage*. The Supermicro 2U Simply Double SuperStorage systems are available in models that offer either 2.5″ or 3.5″ drive bays, and that also support All Flash NVMe SSDs or SAS 3.0 HDDs. Additional value-added features include an additional two rear hot-swap drive bays, 3x PCI-E 3.0 slots, redundant Titanium Level (96%+) high-efficiency power supplies, and support for the latest Intel® Xeon® E5-2600 v4/v3 processors. This broad and feature rich product line allows customers to select the Simply Double solution that is optimized for their specific requirements, from IOPS intensive applications to deployments that require the highest storage capacity. The Supermicro MicroBlade microserver represents an entirely new type of computing platform. It is a powerful and flexible extreme-density 6U/3U all-in-one total system that features 28/14 hot-swappable MicroBlade Servers supporting 28/14 Newest Dual-Node Xeon UP systems with Intel E5-2600 v4/v3 family configurations with up to 2 SSD/HDD per Node. The 6U/3U MicroBlade enclosure can incorporate up to 2 Chassis Management Modules, and up to 2 Switch Modules for efficient, high-bandwidth communications. It can incorporate up to 8 redundant (N+1 or N+N) 1600/2000W high-efficiency (95%/96%) power supplies with cooling fans. 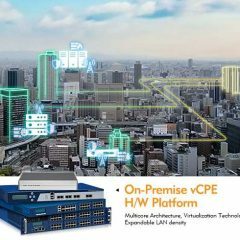 This innovative new generation architecture includes microserver, networking, storage, and unified remote management for Cloud Computing, Video Streaming, Content Delivery, Social Networking, Desktop Virtualization and Remote Workstation applications. Supermicro’s server grade SuperWorkstation motherboards support up to: 2TB ECC 3DS LRDIMM or RDIMM DDR4-2400MHz memory in 16 DIMM slots, 5 PCI-E 3.0 x16 slots for GPU/Xeon Phi™ cards, 8 ports of LSI® 3008 SAS 3.0 (12Gbps) with Software RAID, and dual Gigabit Ethernet LAN ports. Other important workstation features include 7.1 HD audio, 11 USB ports (6 USB 3.0), SLI, Thunderbolt AOC, Hyper-Speed Hardware Acceleration and 160W CPU support with dual or single Intel® Xeon® processor E5-2600/1600 v4/v3 product families up to 22 cores. Supermicro SuperWorkstation motherboards are optimized for customer applications requiring high I/O throughput, storage capacity, and powerful graphics capabilities. 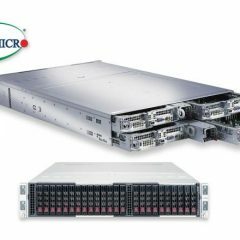 In addition, with Supermicro’s signature server grade quality and support, customers will benefit from more processing capacity in less space with better efficiency. Supermicro SuperWorkstation motherboards are optimized for customer applications requiring high I/O throughput, storage capacity, and powerful graphics capabilities including Science & Engineering, CAD/CAE/CAM, Digital Content Creation, Oil & Gas, and Digital Imaging. The rich multimedia features are excellent for Digital Entertainment.